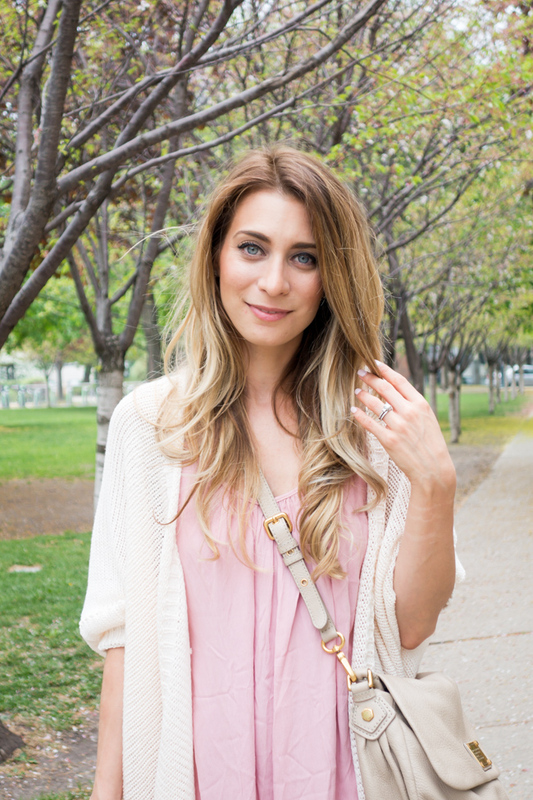 OOTD - Blush Dress For Spring | La Petite Noob | A Toronto-Based Fashion and Lifestyle Blog. As someone who recently switched up professions from shift-work to a steady Monday to Friday 9 - 5 job, having every single weekend off is a new luxury. Couple my new schedule with the fact that the weather in Toronto has been absolutely stunning lately, and I feel as though I've been enjoying Spring at the absolute fullest! Toronto is really beautiful this time of year, and I've been packing my days with exploring new parts of the city. This Sunday in particular Brian and I headed to The University of Toronto campus to see the blooming trees and I couldn't have been more comfortable than in this blush slip dress, with the addition of my favourite long cardigan (last seen here) for some modesty and warmth. Read on to see the full outfit, and for details. I'm really loving the versatility over this long cardigan - I feel as though it has breathed new life into my wardrobe since skirts and shorts that I had deemed 'too short' are suddenly much more wearable. I've changed up my hair slightly for the summer, going lighter and brighter at the ends while moving away from ombré and instead going for a blended balayage. What do you guys think? Hope you had the best weekend! Loving the ligher tips to your hair! A perfect refresh for the warmer weather. It reminds me that I need to add some life to my hair with some henna. I'm so glad that you like it, thank you! Pastel pink looks so pretty on you, I really adore this dress, especially the crochet detailing along the bottom. Also good choice the type of knit!! Love the long cardigan on you, they've become a wardrobe staple for me too! Aren't they the best? I feel as though this one piece has given me a world of options with my closet.